Will Bomb Blast Start Trend of Violence Ahead of Polls? Medics attend to people injured in an explosion during a Zanu-PF rally in Bulawayo (file photo). 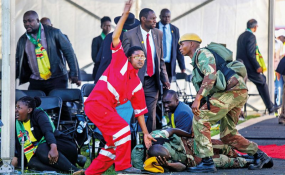 The bomb was detonated soon after Cde Mnangagwa's address when members of the VIP were leaving the stage and almost wiped the revolutionary party's top four, except for Cde Obert Mpofu (secretary for Administration) who did not attend the rally due to other commitments. "We lost two colleagues and some were seriously injured. We still have two who are still in a critical condition. Our chairman Cde (Oppah Muchinguri) Kashiri was also seriously injured and our VP Cde Mohadi was injured on his leg. Our doctors here recommended that he be transferred to South Africa so we sent him to South Africa with others who are not here. Mai Muchinguri-Kashiri was the first to be discharged and we are happy that she is back with us here. was in great pain and he has not yet fully recovered but because he is a soldier we are with him here today. He lost his brothers during that time and we encouraged him to take a rest. We hope that he we will quickly recover because we want him back at work. So Cde Mohadi we love you and get well soon." He said even at Government level, ZEC's independence was never interfered with.